Gray matter is a term that is sometimes used when talking about brain anatomy and migraine and is an important word for migraineurs to understand. When we're looking at migraine and headache information, whether it's from our doctor, a book, or an online article, we sometimes come across medical terms that can be confusing. Sometimes, it's easy enough to substitute another word or a short phrase for the medical term. At other times, substituting just doesn't convey quite the same meaning or takes more than a few words. 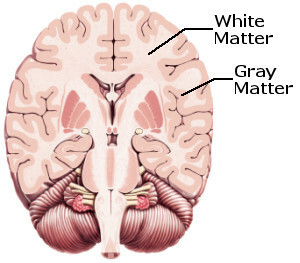 Gray matter is "neural tissue especially of the brain and spinal cord that contains cell bodies as well as nerve fibers, has a brownish gray color, and forms most of the cortex and nuclei of the brain, the columns of the spinal cord, and the bodies of ganglia -- called also gray substance." Used in a Sentence:** Gray matter** changes are sometimes a target of migraine research. Discussion:Since migraine is a disease of the brain, various areas of the brain are considered prime targets for migraine research. White matter lesions have been the target of several studies, and more studies are looking at gray matter and gray matter volume.